Need a ride to the Daytona Beach or Orlando Airport? Don't worry about the long drive in traffic or paying parking fees at the airport. Our professionally attired chauffeur will pick you up at any location in a clean, luxury sedan for a worry free ride to curbside check-in of your departing flight. And yes, we are licensed and permitted for all surrounding airports and cruiseports. Whether you are heading to the airport for business or pleasure, a chauffeured limousine can ease the stress of airport parking and freeway traffic. And, if friends are arriving at the Orlando or Daytona Beach airport, why not treat them to the elegance of a chauffeured limousine. Providing professional limousine service to and from the airport in Daytona Beach, Orlando and Jacksonville - Call Elegant Limousines to reserve now. If you're coming in for a corporate event in Daytona Beach, Orlando, Palm Coast, St. Augustine or Jacksonville consider Elegant Limousines of Palm Coast for your local car service. Forget expensive and uncomfortable cab rides and hotel parking fees for your rental car. Are you an Event Planner looking to get your clients around Daytona Beach? 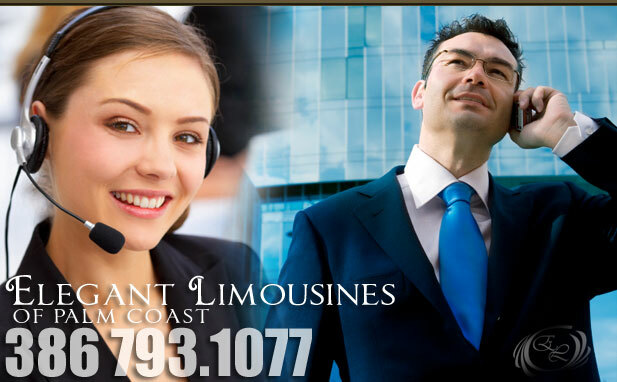 Elegant Limousines of Palm Coast offers 4-passenger sedans and 8-, 10- and 20-passenger limousines. And yes, we are licensed and permitted for all surrounding airports and cruiseports. We can pick you up and drop you off at the airport or take you to that special Daytona Beach event. Providing professional limousine service for your corporate event in Daytona Beach, Orlando and Jacksonville - Call Elegant Limousines to reserve now. Do you really want to sit on a crowded bus or in an uncomfortable cab to start your cruiseship vacation? When you enter one of our beautiful limousines or our luxury sedans, your vacation has already started. We can deliver you to your cruiseship at Port Canaveral from Daytona Beach, Palm Coast or Orlando while you enjoy a movie and a glass of wine or champagne as you and your family are whisked away to your dream cruiseship vacation. There is no need to worry, Elegant Limousines can accomodate any amount of luggage. Our professional chauffeur will handle it all. Elegant Limousines is fully insured and permitted for Port Canaveral and surrounding airports. Providing professional limousine service to and from your cruise ship in Daytona Beach, Orlando and Jacksonville - Call Elegant Limousines to reserve now. Your day should be like no other. Our Platinum Wedding Package is the Icing on the Cake. We only offer the Platinum Wedding Package because you shouldn't have to settle for less on your Wedding Day. Our elegant white stretch will arrive with a professionally dressed chauffeur, who will roll out the red carpet and treat you and your guests like royalty. Inside the limousine will be decorated with beautiful flowers and wine or champagne will be provided for toasting in celebration. We work with most Daytona Beach area photograghers and can help capture those unforgettable shots in the limo. Providing professional limousine service for your wedding in Daytona Beach, Orlando and Jacksonville - Call Elegant Limousines to reserve now. Prom is a time for friends, couples, and fun for all. Arrive to the biggest event of your high school experience with the coolest limousine in Daytona Beach. Our 8- & 10-Passenger Super Stretch has the inside atmosphere of a dance club and neon lights to really show off. Parents, you can rest at ease as our professional chauffeurs are trained for safety and are screened for excellent driving records. Providing professional limousine service for your Prom or Homecoming in Daytona Beach, Orlando and Jacksonville - Call Elegant Limousines to reserve now. Eliminate the hassle of parking and traffic with a Speedweeks Limousine for the Daytona 500 or the Coke Zero 400. Hire our 8- or 10-passenger limos for Speedweeks, the Daytona 500 or the Coke Zero 400. We'll pick you up at any area hotel in Daytona Beach, Ormond Beach, Port Orange, or even Orlando or Jacksonville. We are permitted to drop you off right at Daytona International Speedway. And we'll be be ready to pick you up as soon as the Daytona 500 or Coke Zero 400 is over to whisk you away from the race traffic. Providing professional limousine service for Speedweeks, the Daytona 500 or Coke Zero 400 in Daytona Beach, Orlando and Jacksonville - Call Elegant Limousines to reserve now. Treat your special someone to a luxury limousine ride as part of your romantic Valentine's Day. Show them how much they mean to you. Our professional chaffeur will arrive and roll out the red carpet. Begin your special night with champagne or wine as we whisk you away in our Valentine's Day Limousine. Eliminate the hassle of parking and traffic. Hire our 8- or 10-passenger limos and celebrate your Valentine's Day romance in style . Providing professional limousine service for Valentine's Day in Daytona Beach, Orlando and Jacksonville - Call Elegant Limousines to reserve now. Celebrate in style and safety and let our professional chaffeur roll out the red carpet. Begin New Year's Eve with champagne or wine as we whisk you away in our New Year's Eve Limousine. Eliminate the hassle of parking and traffic. Hire our 8- or 10-passenger limos for New Year's Eve in Daytona Beach. Providing professional limousine service for New Year's Eve in Daytona Beach, Orlando and Jacksonville - Call Elegant Limousines to reserve now. Celebrating your 30th, 40th or 50th Birthday? How about your 25th or 50th anniversary? Make it a special night and be safe at the same time. Our professional chaffeur will pick you up with the red carpet treatment and deliver you to your birthday party or wedding anniversary dinner. Leave the driving to us in our 8-passenger Super Stretch limo. Or, choose our 20-passenger Ultra Stretch Excursion and bring your friends. Providing professional limousine service for a Birthday Party or Anniversary Celebration in Daytona Beach, Orlando and Jacksonville - Call Elegant Limousines to reserve now. Planning for the last night out on the town as a single guy or gal? Make it a special night and be safe at the same time. Our professional chaffeur will pick you up with the red carpet treatment and deliver you to your Bachelor Party or Bachelorette Party. Leave the driving to us in our 8-passenger Super Stretch limo. Or, choose our 20-passenger Ultra Stretch Excursion and bring all of your friends. Providing professional limousine service for a Bachelor Party or Bachelorette Party in Daytona Beach, Orlando and Jacksonville - Call Elegant Limousines to reserve now. We can provide you with a night to remember for events at Peabody Auditorium, the Ocean Center or at the News-Journal Center in Daytona Beach. Make it a special night and be safe at the same time. Our professional chaffeur will pick you up with the red carpet treatment and deliver you directly to the Peabody Auditorium, the Ocean Center or to the News-Journal Center. Leave the driving to us in our 8-passenger Super Stretch limo. Or, choose our 20-passenger Ultra Stretch Excursion and bring all of your friends. Providing professional limousine service for a events at Peabody Auditorium, the Ocean Center or the News-Journal Center in Daytona Beach - Call Elegant Limousines to reserve now. We can provide you with a night to remember for events at the Orlando Convention Center, the Bob Carr Center or Amway Arena in Orlando. Make it a special night and be safe at the same time. Our professional chaffeur will pick you up with the red carpet treatment and deliver you directly to the Orlando Convention Center, the Bob Carr Center or Amway Arena. Leave the driving to us in our 8-passenger Super Stretch limo. Or, choose our 20-passenger Ultra Stretch Excursion and bring all of your friends. Providing professional limousine service for a events at the Orlando Convention Center, the Bob Carr Center or Amway Arena in Orlando - Call Elegant Limousines to reserve now.